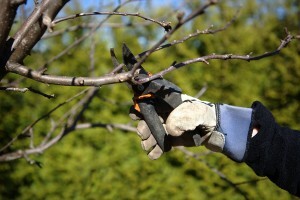 Now is a great time to prune back dead branches and woody shrubs. This winter has been anything but normal. While some of us are clearing away damage from heavy rains and floods, others are already seeing weeds popping up due to unusually warm temperatures. Here are a few things you can do in the next few weeks to have a beautiful lawn and yard during the growing season. Start by doing some pruning. This is a great time to cut back or shape trees and woody shrubs. Then clear away any fallen leaves and branches as well as any dying plants. Allowing them to decay on their own invites disease and insects into your garden. Dandelions and wild onions and crabgrass … oh my! Begin your weed control now while they are young and easier to manage. Use a post-emergent herbicide to kill weeds that have sprouted in your lawn. Remember to read directions carefully before applying. Pull them or dig them up. If you just have a few weeds, remove the entire plant including its roots. Use a post-emergent herbicide. If you have been experiencing a mild winter, you may already see quite a few weeds in your lawn. This can happen when a pre-emergent herbicide’s effectiveness wears off due to moderate temperatures. Treat these early weeds with a post-emergent herbicide containing the active ingredient formasulfuron or flazasulfuron. Be ready to apply your pre-emergent herbicide. The best time to use pre-emergent herbicides is middle to late February. This will effectively control troublesome summer weeds including crabgrass and dandelions. For long-term weed management, re-apply the pre-emergent herbicide in April. Consider different landscaping options. Weeds may adapt better to slopes and wetter areas than turf. If you have areas like this, consider ornamental plants or groundcovers that are more tolerant of those conditions. Herbicides are most effective when you carefully follow the manufacturer’s recommended rate and application directions. Always check the label to make sure your turf type is listed. Avoid using a pre-emergent herbicide once your lawn has started to green up for the season, or it might damage your turf as well as the weeds. Watch our blog for more lawn care tips. Having a healthy lawn is the best way to prevent weeds in the future.